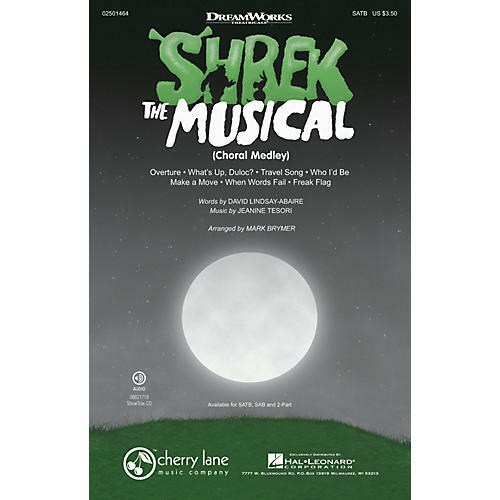 Shrek: The Musical, based on the Oscar®-winning Dreamworks film that started it all, brings the hilarious story of everyone's favorite ogre to life on the Broadway stage. Shrek turns out to be a real hero when he shows up to rescue the feisty Princess Fiona. Featuring a fantastic collection of new songs by David Lindsay-Abaire and Jeanine Tesori, this 9-minute medley offers an equal portion of romance, twisted fairy tale and totally irreverent fun for choirs of all ages. Songs include: Overture; Freak Flag; Make a Move; Travel Song; What's Up, Duloc? ; When Words Fail; Who I'd Be. Available separately: SATB, SAB, 2-Part, ShowTrax CD. Duration: ca. 8:45 (with optional cut: ca. 6:00).